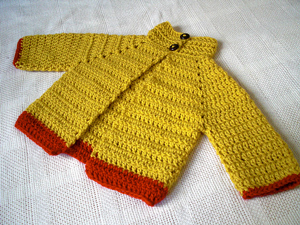 10 Free Crochet Cardigan Sweater Patterns for Baby Boys! 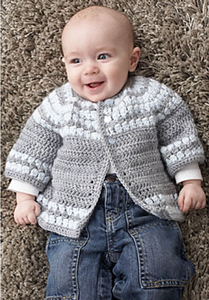 Finding cute crochet sweater patterns for baby girls is easy – there are hundreds to choose from, some right here on Moogly! 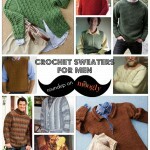 But finding crochet patterns for baby boys, or even unisex patterns, can be more of a challenge. 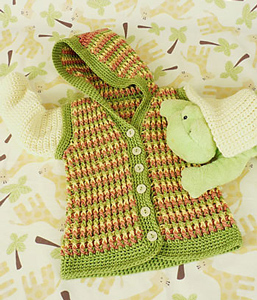 Today I’ve combed the internets to bring you 10 free crochet cardigan sweater patterns for baby boys! 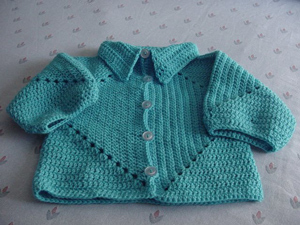 Sue’s No Holes Hexagon Baby Sweater by Cozy’s Corner: This unisex option features a cute fold down collar and unique construction! Everyday is a New Sweater Day by Rima Aranha, on Yarny Days: Versatile and fun! Instructions included for how to change it up. 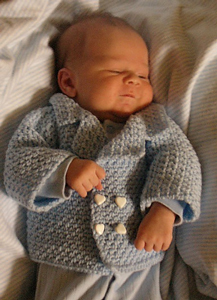 David Peacoat by Melissa Mall, on Inner Child Crochet: Such a handsome little man! I love the peacoat shape! 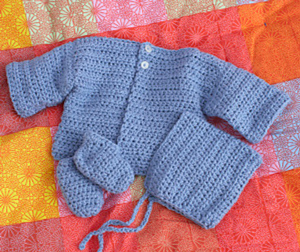 Chunky Monkey Baby Cardigan by Laura Tegg, on Lolly’s Crafty Crochet: Simple and quick, with lots of texture to keep it interesting! Cluster Yoke Cardigan by Yarnspirations: Such a great design! It reminds me of Fair Isle, but easier! Hooded Sweater & Hat by Caron International Yarns (via the Wayback Machine): This is a pattern I made several times when I was a new crocheter – both with and without the hood. Sadly, Caron doesn’t host the pattern anymore; print it out now to add to your collection! Newborn Layette by Darla J. Fanton, on Red Heart: This one is worked sideways, giving it a great unique look! 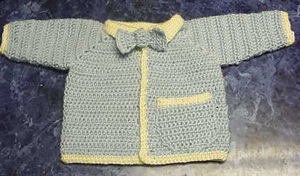 My Little Man Baby Sweater by Mandy Nihiser, a Ravelry download: I love the bow tie and pocket details on this baby cardigan! 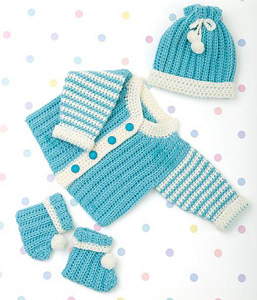 Simple Baby Set by Lion Brand Yarn: Another great option for beginners, this baby sweater is worked flat in rows! 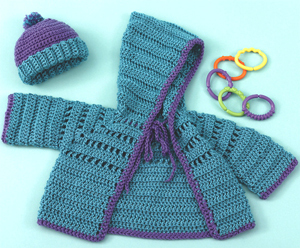 Turning Stone Baby Hoodie by Kim Guzman, on Crochet Kim: This highly textured baby sweater is full of options: with or without sleeves, with or without the hood… however you make it, it’ll be adorable! 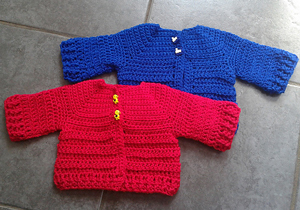 Have you crocheted baby boy cardigans before? What’s your favorite pattern? 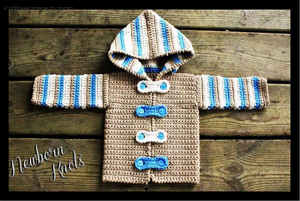 If you’re looking to purchase a pattern, I’ve got the Sven Sweater available, and I also love the look of the Baby Boy or Girl Striped Hoodie Sweater by Newborn Knots (both pictured below). 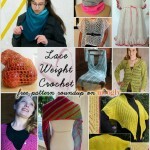 Light & Lovely Lace Weight Crochet Patterns! I have been looking for a good boy pattern!! I love #2 but when I click on the link it goes to a list of pattern links. Then I click on the name of the pattern there and it takes me to a page with a bunch of links. No pattern in sight. Oh dear, the site must have been taken down, thank you for letting me know! I just made the Caron cardigan in navy and white. Fun and beautiful!! But can you recommend a hat to go with it in the same yarn? Thanks!! I just tried finding the matching hat, but can’t spot it. Can you possibly send me a link? Thanks!! Thank you Kim! I’ll fix the link in the post! thanks Tamara. I am so in love with your designs! Wow, they really deleted a lot of patterns off the Yarnspirations website – such a bummer! Thanks for letting me know and providing the link Katy! I’ll edit the post! 😀 My pleasure Kim! Glad to have made the link switch over to your blog! 🙂 I’m so glad you enjoyed the collection! Congratulations on the new grandson! I love all and each of them but David Peacoat has stolen my heart. I’m going to start with it right now. Thanks a lot for sharing this beauties! 😀 I’m glad you enjoyed them! Thank you! 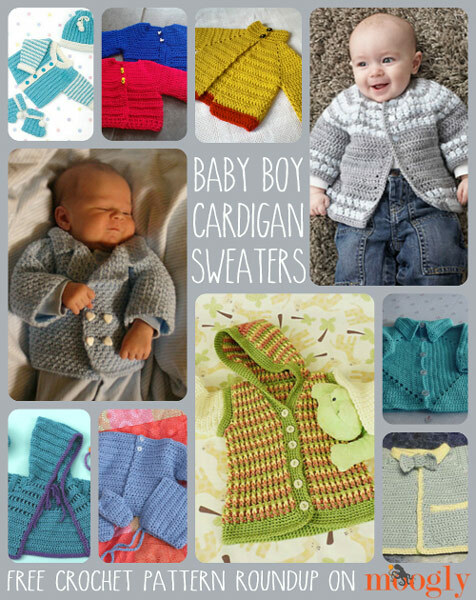 Thanks so much for sharing all your researched items on this post for baby boy cardigans !! I always enjoy watching you on YouTube and reading your moogly blog page. Great job! Thumbs up !! Thank you so much Victor-Noel! Hi Sharon! Looks like a few urls have changed since 2013! I’ll get things cleaned up – thanks for letting me know!